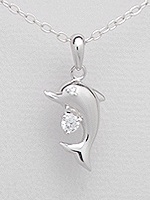 Picking out a dolphin necklace can be challenging. After settling on the pendant of your choice, you'll have to select a matching chain. Chains come in a wide variety of designs and each design is available in different thicknesses. After doing this for so many years, we still have to try on each chain design and different thicknesses to arrive at the best match. 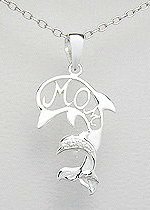 Get the sterling silver dolphin necklace that is just right for you by buying your favorite dolphin pendant and a matching chain. 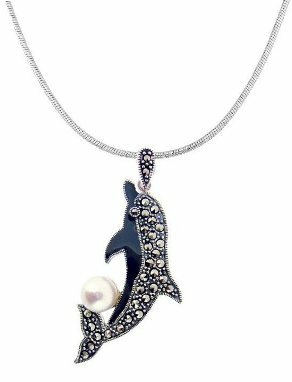 We've helped you with obtaining the right match by preselecting a special range of 925 sterling silver chains that best match our premium quality sterling silver dolphin pendants and furthermore, try on all the chains with each pendant to identify the best looking combination. 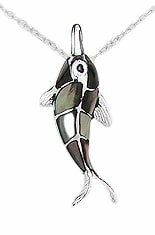 However, you may have your own preference or you may be looking for a sterling silver dolphin necklace for men or for women and would prefer a chain that is more masculine or feminine. 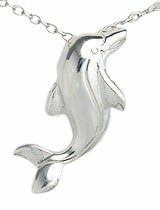 Enjoy a 15% discount off the chain price when you buy a pendant in the same order to make up a dolphin sterling silver necklace. 1. 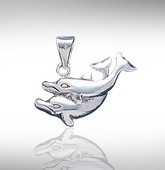 Purchase a dolphin pendant by clicking its 'Add to Cart' button. The height measurement of the pendants on this page does not include the bail. The whole necklace is about simple, flowing lines and minimalism. 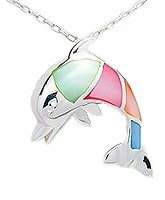 As most of the dolphin's body is artistically outlined and not filled out with silver, the whole sterling silver dolphin necklace is not too heavy despite the huge size of the dolphin pendant and the substantial snake chain. 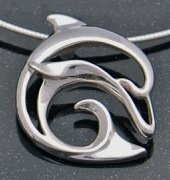 sterling silver snake chain regarding simple, flowing lines and weight applies to the Artistic Contemporary Style Sterling Silver Dolphin Pendant as well. It is just so easy on the eye... and on your neck as well. sterling silver Box Chain is a workable compromise. This design is also available in Pewter and Bronze. 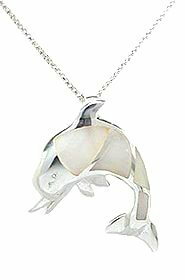 This understated and elegant dolphin matches the same chains as the pendant above - sterling silver snake chain and sterling silver Box Chain. 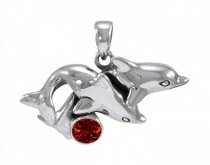 The well polished, lively dolphin couple look very much three dimensional from the front. They come with plenty of curves and should be matched with chains that are rounded. Oddly the two recommended chains are the thickest and thinnest in our range. The gemstone below the bonded pair is Garnet. Dolphins are amazing in so many ways. They even surf! And it is possible that dolphins surf for fun and enjoyment like humans. Isn't it fun to surf with others? Dolphins think so. Pods of up to a few hundred have been seen to surf the waves together. 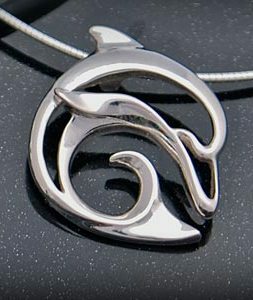 As shown in the silver surfing dolphin necklace image above, this pendant goes really well with a sterling silver snake chain. 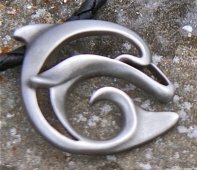 The snake chain echoes elements both on the waves and the dolphin. If you do not fancy a thick chain, sterling silver Cable Chain B is a good alternative. Here's a short clip that captured surfing dolphins. Isn't it great to wear a necklace that captured the moment? 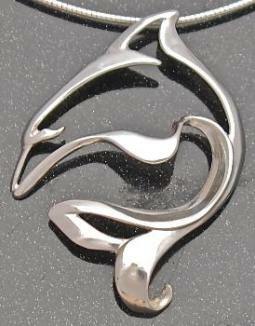 Somehow this tribal art dolphin matches all our chains. You can safely pick any you like. These two work the best. I guess they are knotty in some ways. Chain matching is not necessary with this one. It is a single piece necklace. If you're looking for an easy option, this is it! Neither do you need to worry if it looks good. 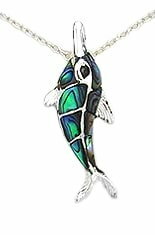 The two dolphins are well crafted with choice pieces of Paua Shells inlaid. Length wise, some flexibility is built in. The full length of the necklace is 18 inches. There's a ring on the 16 inch and 17 inch mark, you can clip there if a shorter necklace is more suitable. 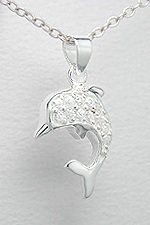 To reiterate, this piece of dolphin jewelry serves as a 16, 17 and 18 inch necklace. 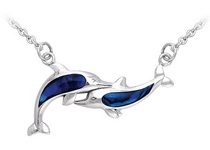 Are you concerned your dolphin jewelry gifts will not be appreciated? 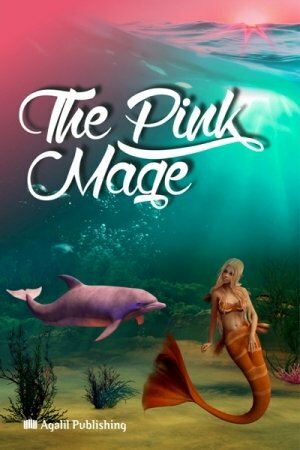 We have created ‘Gift Enhancers’ like The Pink Mage to turn your dolphin jewelry into perfect gifts. sterling silver Cable Chain A, a much thinner version of sterling silver Cable Chain B.
sterling silver Box Chain is one option to a beautiful sterling silver dolphin cross necklace. Most simple chains will work fine. You would want admirers' gazes to lock onto the aquatic elements that make up the cross, and the Paua shelled dolphins. There is something inspiring about a dolphin's pose with its arched body and head pointing upwards. With two such dolphins, it is doubly uplifting! 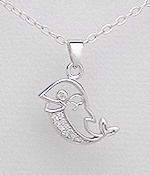 So, what kind of chain is right for an inspiring sterling silver dolphin necklace? 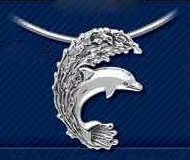 If you would like more information on the Dolphin pendants, click Sterling Silver Dolphin Pendants to visit the dedicated pendant page.